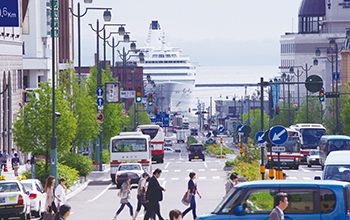 In the area behind the Port of Otaru, there are a wide variety of sightseeing sites where you can fully enjoy the great nature unique to the northern region. 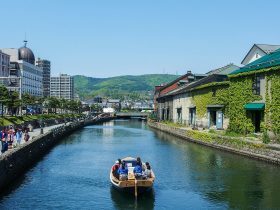 Otaru and the surrounding area is one of most popular tourism areas in Japan. Port of Sakai - San-in featuring "Food and Manga" and "Home of Gods"
Dating from the Meiji Period until the beginning of the Showa Period when Otaru's economy was at its zenith, the stone houses of merchants and modern western-style buildings lining the bustling merchant's quarter are still plainly evident today. Visitors can feel the spirit of the good old times from the rows of shops dealing glass, music boxes, sweets, and other Otaru specialties to the night-light and steam clock at the Meruhen Kosaten (Marchen Crossroads). Along the canal, which is a symbol of Otaru city, there is a row of stone storehouses. It preserves the appearance of the city at the old time. At night, gas lamps are lit. Very fantastic views give you a melancholic feeling for all four seasons.Our canal cruise, a boat tour going around the canal, is also popular. 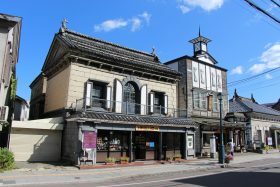 At the center of the Otaru city, many old stone-buildings are remained. In Otaru there used to be branch offices of big banks. 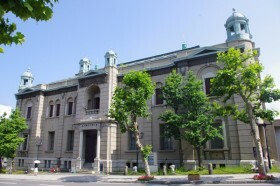 Especially the Ironai District, the economic center of Hokkaido from the late 1800s and the early 1990s, has many bank buildings constructed in those days and currently creates a unique scenery with these architechtures. In the suburb, there are a palatial house, called “Nishin Goten (herring palace),” and a luxury house of a fisherman’s boss. Inside of the buildings, valuable materials are exhibited to describe the herring fishery at the peak. At one time Otaru prospered as a herring village. Even today, the palatial mansions and simple houses of people who toiled away at herring fishing, as well as other historical buildings, dot the coastline as a reminder of prosperity in the golden age of herring fishing. You can enjoy the beautiful sea and the majestic beauty of the coastline from the observation deck. Otaru is surrounded by this abundant nature. There is also an aquarium where you can get close to the habitats of over 250 kinds of animals and fish permanently on display. Mt. Tengu is one of the best three major spots to see the night view of Hokkaido. 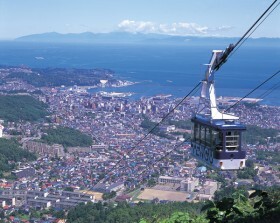 By 4- minute ropeway ride, you will reach the top to see the port of Otaru and the Ishikari Bay, as well as the Shokanbetsu mountain range and the Shakotan Peninsula over the sea. 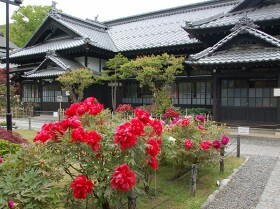 There are also a 100-year-old cherry tree, called “Tengu zakura,” and Tengu House where about 700 masks of Tengu goblins from throughout Japan are exhibited. 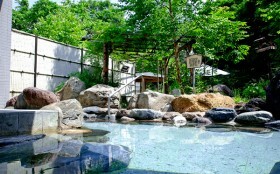 Hokkaido has the largest number of hot-spring resorts (onsen). Otaru city has also many onsen. The representative one is Asarigawa onsen. There are also various sports facilities maintained for tennis and golf in summer, and ski in winter. For further exploration, visitors can enjoy the hot springs of Jozankei Onsen, a hot spring resort that represents Hokkaido. The Shakotan Peninsula is included in the Niseko-Shakotan-Otaru Kaigan Quasi-National Park, and the Shakotan Sea has been designated as Hokkaido's only ocean park. 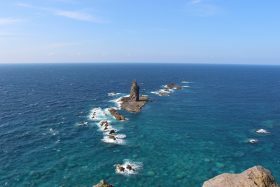 Cape Kamui (or Shakotan Blue), and Shakotan Peninsula are designated as must-see Hokkaido assets with its 42km long coast, and with its steep cliffs and strange rock formations. The fishing industry thrives as well, and sea urchin and cod roe are famous products. 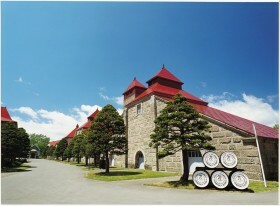 It was established in 1934 as the first distillery of NIKKA WHISKY DISTILLING CO., LTD. There are “the Whisky Museum” and buildings which were designated as a registered tangible cultural property. You can visit and see the history of whisky and the manufacturing process. It was the setting for Massan, a morning TV drama series by a Japanese broadcaster NHK in 2014 to 2015. It is very popular tourist area. Mt. Yotei, showing us very beautiful views every season, has a shape very similar to Mt.Fuji. Therefore, it is called Ezo-Fuji (“Ezo” is an old name of Hokaido). In the area around the mountain, you can enjoy outdoor sports, including trekking. Agriculture and dairy husbandry are thriving here, and you can buy fresh local products in farmers’ markets. In the ranches dairy products such as milk, cheese, and ice cream, are very popular. There is also water spring. The water here is selected as one of the one hundred exquisite water of Japan. The national route 237 from Biei to Shimukappu is called Hanabito Kaido. 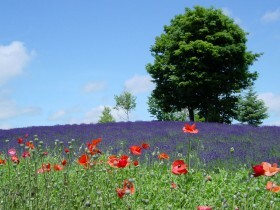 Various kinds of flowers and agricultural products make the hillsides colorful along the route in each season. 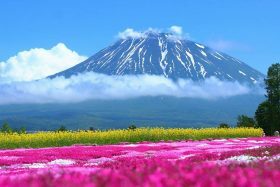 You can enjoy the distinctive and spacious sceneries of Hokkaido. Cuisines with local vegetables and specialty products are very popular.